Our purpose of a jet ski show is to amaze and entertain spectators of all ages and backgrounds with maneuvers and stunts, above and below the surface of the water. 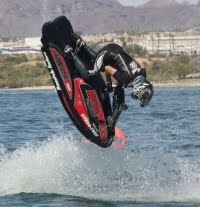 We perform jet ski tricks which vary from subs to fire hoses; and back flips to barrel roll's. These days our jet ski shows include many multi-trick combos including 3 or 4 back flips in a row! 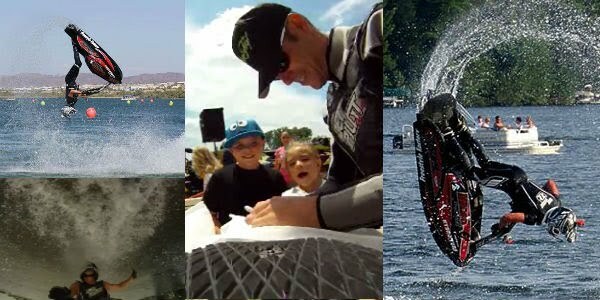 If you have not seen a jet ski back flip yet, or would like to see an example of our jet ski show, check out our video page. We have performed jet ski shows for: private classes, small clinics, medium-sized birthday parties, moderate waterfront concerts, and huge air and water show venues. Perhaps you have seen us on network television? Or in one of our 10 action sports videos? We have appeared on such networks as the Weather Channel, ESPN, Fox, WGN, NBC, UPN and even Good Morning America. Let us create a custom jet ski show just for your event. Jet Ski Stunt Shows is a division of Twangled Inc.